I remember seeing this video ages ago, on MTV, when I was about 12 years old. I haven’t seen it much since, although I vaguely remember it popping up from time to time, perhaps on Cartoon Network. It was created by animator John R. Dilworth, who later went on to create Courage the Cowardly Dog. 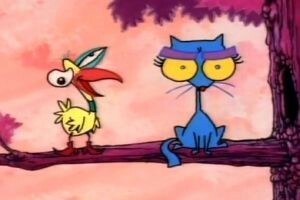 I really like this comical style, and it fits in neatly with the 90’s cartoon style, shared by the likes of Ren & Stimpy. Just recently I stumbled across the clip again (Youtube can be awesome for this melancholic stuff) and I still love it.